A 10-year-old girl presents herself shortly after a seizure. She has experienced low-grade fever for a week, a severe headache for two days and loss of vision since waking up today. Her medical, family and birth histories are unremarkable. The scenario that would come to mind immediately is of a knot of white-coated medical students gathered at the foot of the 10-year-old’s hospital bed, poring over the bed-head ticket, unsure and ill at ease, attempting to fathom what is wrong with her, while a Professor taps the bed with his pen impatiently and the senior nurse on the ward-round sniggers knowingly. Wrong diagnosis of the scene! It is in fact a paediatric case history which any medical student may download onto his or her mobile phone and try to diagnose through a series of steps, in a fun learning experience being generated from Sri Lanka but popular half-a-world away in the United States of America, Canada, Britain, Australia and New Zealand. Medicine made fun is the bottom line and lessons in the main specialities of paediatrics, medicine, surgery and gynaecology and obstetrics which are very tough and tedious for many medical students can be played as a game, the Sunday Times learns. The brainchild of Dr. Nayana Somaratna, ‘Prognosis: Your Diagnosis’ came into being about one and a half years ago with its platform being the iPhone, iPad and Android. These lessons on medicine are available to anyone free of charge and has been made possible by a seven-member team headed by Dr. Somaratna, all of whom except one are based in Sri Lanka. Two of the team: Dr. Udugama and Dr. Pinto. 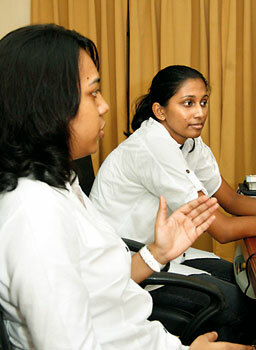 The team which is part of the ‘Medical Joyworks’ company comprises Co-Founders Dr. Somaratne and Sandaruwan Gunathilake, a computer whizz, and Dr. Subodhi Pinto, Dr. Malika Udugama, Dr. Narmada Ranaweera, Kosala Liyanage and illustrator Raitis Kalnins working from Latvia. The funding for Medical Joyworks comes from the government of Chile through the ‘Start-up Chile Programme’ that attracts early stage, high potential entrepreneurs to bootstrap their start-ups in Chile, using it as a platform to go global, explains Dr. Udugama. So their operations span the globe, linking Sri Lanka, Latvia and Chile. “We create mobile phone applications (apps) based on medicine,” says Dr. Udugama, while Dr. Pinto explains that anyone can download the application and play the game free of charge. 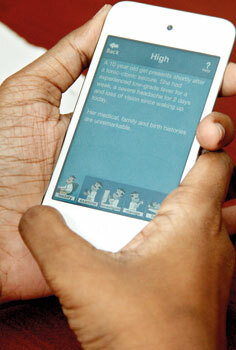 Regrettably, the application is not popular in Sri Lanka because there are not many Smart Phone users here, it is learnt. Medical Joyworks not only caters to the terrified medical student, but even to qualified doctors, nurses and other health-care workers such as paramedics. How it all began was simple, according to them. While on internship, thinking about the arduous study that medical students have to undergo burning the midnight oil, Dr. Somaratna attempted to “gamefy” the work. Having created a prototype, he passed it around to doctors who liked the concept immediately. The steps of the game are equally simple – on the Main Menu of the application would be a ‘List of Cases’ from which the “player” will select one. Citing just one case titled ‘High’, Dr. Udugama explains that it falls under Paediatrics and would give a basic patient history. Thereafter, would pop up the ‘Examination Findings’ which the player works on followed by ‘Investigations’ where the player will have to choose what tests should be carried out. The ‘Results’ would come next, giving a working diagnosis and ‘Management’ of the case where the player will choose from a set of given steps. Finally, the ‘Evaluation’ will indicate how he has fared, followed by a detailed discussion on each and every step and also a brief take on the disease itself. As the team members are not specialists, they seek the help of a Panel of Consultants for the content of the apps. “These Consultants, scattered across Sri Lanka do it for free,” says Dr. Udugama, pointing out that the panel sees it as a service to teach young doctors globally. With the user network widening, Medical Joyworks also gets real-life cases, she says, adding that altogether they have more than 100 case histories, with a new case being added every week. One of the most recent case studies presented by a Consultant of the Department of Family Medicine of the Mayo Clinic in Rochester, US, is of a “30-year-old white male presenting with a rash on his right anterior thigh”. Their next step is to target specialities, zeroing on Cardiology and put out “paid apps” but at a minimal cost of about US$5, she says, adding that free apps for patients, starting with ‘Prognosis for Mums’ for expectant women has already been launched. “The app is not a replacement for a doctor, it is a way for the patient to learn more about a disease. We have clearly stated that if they have any concerns, they should always get in touch with their doctor,” Dr. Udugama is quick to point out. The kudos from the advanced west within a short time have given the team at Medical Joyworks a sense of satisfaction that they have put Sri Lanka on the map for international medical apps. “This recognition not only makes us proud but is also an achievement for Sri Lanka,” Dr. Udugama adds. With more than a million users, half from America, Medical Joyworks is not a fly-by-night operation. With a major feather in their cap being the fact that the applications are recognized even by eminent groups such as the Royal College of Surgeons, Britain, the Sunday Times understands that they hit No. 1 in the most downloaded free apps in the medical category for iPhones in the US a few weeks ago. A majority of those downloading their product are in the US because of the common use of Smart Phones there, says Dr. Udugama. The applications are also recommended by five medical universities in the US and six medical universities in Europe, for our work is frequently updated and there are references against current medical guidelines, she stresses. Medical Joyworks has also signed an agreement with the AT-Still University of Health Sciences in Arizona to customize its apps to teach their medical students, according to her. The university, having completed a pilot study, is now creating cases based on all the modules to be included in the apps to teach its students, she says. Meanwhile, back home in Sri Lanka, the team has won the e-Swabhimani award in the e-Learning and Education Category presented by IT professionals, Information and Communication Technology Agency (ICTA) in December 2011 and was in India in April, winning the ‘Smashup for the startup’ competition held by TiE Mumbai. The challenge they are now working on is to beat the very popular Web MD and wrest the No.1 slot for medical applications.